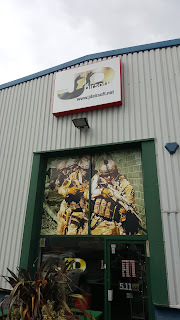 This week I took a trip to JD Airsoft, in Cannock, which is the UK’s largest Airsoft retail Superstore. It is around an hour’s drive from my home town in Derbyshire. JD Airsoft is easily accessible from the A34 or the M6/M6 Toll and is situated amongst the industrial units of Virage Park on Green Lane. It is well signposted, and has a total unit space of 4,500 square metres so it’s hard to miss! There is ample free parking for customers located just outside the front door so there isn’t far to walk which is always a bonus. They are open 7 days a week and even stay open late on Thursdays until 8pm. The company itself has been running for 7 years, and opened the doors to their new premises’ at Virage Park in early May 2012. Since opening their new premises doors 3 years ago, they have grown and diversified their product and services line, so I thought it would be worth revisiting them to find out what’s new! The first thing to mention, which set a good precedent for me, as it impressed me before even entering the shop was, to enter the premises you must press a button on the door and the staff press the door release on the other side, which I haven’t encountered at any Airsoft store I have visited. I really like this feature as it shows the company are really on top of their store security, which is so vital with how controversial Airsoft is and our current political climate. The showroom is clean, well presented and organised, so it is easy to navigate if you know exactly what you want, but I can guarantee, you will always leave with more after browsing because of their extensive range! As JD Airsoft have a Showroom space of 3,000 square feet, the range of products they stock is quite substantial! You can pick up everything you need for a day’s skirmishing and more, ranging from tactical clothing/boots to BBs and Gas, accessories and even a new pistol or AEG. 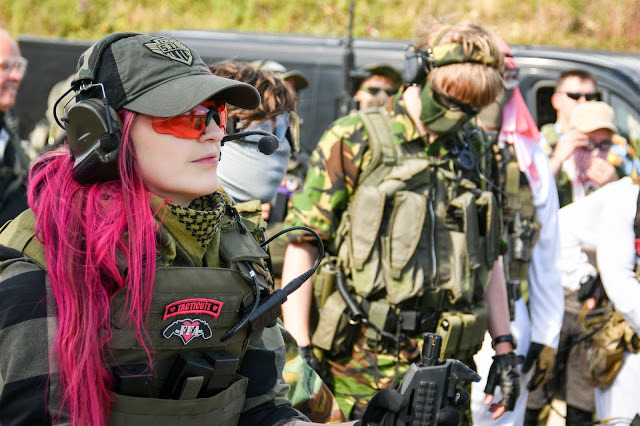 JD Airsoft only stock products that are made from quality materials, are reliable and that have a sound warranty so the customer can feel confident in their purchase. Their aftersales care and returns system is excellent as they work closely with brands and their suppliers to ensure the customer gets the best experience possible. They stock an array of well-known brands including ASG, WE, ICS, Nuprol, Cyma, Classic Army, KWA, Helikon, 5.11 Tactical and the brand everyone in the UK airsoft scene is talking about: Krytac. When I entered the store I was immediately greeted by Amanda and Dan from the sales team who always make me feel really welcome when I visit. The shop is managed by Phillip ‘Phil’ Corns who has 15 years’ experience in the Airsoft Industry and is a regular player at sites in and around Staffordshire, he also runs ‘Hilton Park’ Skirmish Paintball Games which is a 24 acre Woodland site located on Hilton Lane in Wolverhampton – a site I have yet to try but have heard nothing but positives reviews for. Upon speaking to Phil, you will discover he is chatty, animated and full of laughs. You can tell how passionate about Airsoft he is, which fills me with confidence for JD. The shop has 5 other experienced members of staff including their technicians who perform all repairs, custom work, servicing and upgrades in house. Phil himself is also a tech engineer and was trained by Classic Army, he is also the artist behind the laser engraving service they offer in store, which has been performed on my G&G Black Rose, WE Glock 18C and Multishot TRMR – the quality of the engraving is fantastic and was all done whilst I chatted away to the staff over a cup of tea! The staff are all experts in their fields, knowledgeable and always happy to help with anything from kit advice to improving your guns performance. They are friendly, approachable and there is always a relaxed atmosphere in store which makes for a positive shopping experience. The showroom is also equipped with a hot drinks machine, a sofa and a customer toilet as well which is a lovely touch. In store JD have a state of the art dual firing range with interactive shooting simulation so you can try any new RIF before you buy. The shooting range JD have is definitely something to be admired! It is the only one of its kind in the UK. It features targets on an interactive screen so as soon as a BB hits the board, a red marker is displayed to show the shooter where the hit landed, but that’s not all, the system not only displays hits but is capable of displaying different targets at various distances and it can make them move/spin for an added challenge. I spent half an hour with Dan trying out the ARES Amoeba Honey Badger in the range and having a blast! The interactive screen offers the shooter a real challenge and is a lot of fun! With the diversification of the airsoft market we have seen the rise of the blank firing grenades, and JD Airsoft are definitely leading the pack, they are the exclusive stockists of the Concept Tactical TRMR (Tactical Reloadable Maritime Ready device), a multipurpose munitions delivery system that was designed for maritime use which you can be seen being used at Skirmish sites around the country. It makes use of a twist to arm inertia recoil firing system making it the safest and fastest reloadable impact grenade on the market right now. There are currently 3 versions – the original TRMR, the multi-shot base TRMR which holds 3 bangs and the newest X4 TRMR which is capable of deploying .209s, 8mm, 9mm, 12 Gauge/Mag Flash rounds for airsoft use all in one. The Mag Flash rounds are new to the Airsoft market and have been extensively tested for safety and noise pollution regulations and they pack a serious punch! Deploying a Flash Mag round into a pitch black room of enemy players that aren’t expecting it is epic. The TRMRs are available in a plethora of colours to suit from Black, pink to even Praetorian Purple and prices start at £79.99 for the original and X4 base TRMR and go up to £94.99 for the Multishot. One of the key features to the TRMR is that it costs less than 7p per bang after the initial outlay cost of the grenade – much cheaper than any disposable pyro! The TRMRs success is down to its simplicity and durability, they have no pins or levers to lose or break, the materials used in their construction mean that they will withstand the test of time. They are incredibly easy to reload - there is no need for any extra loading tools, just unscrew, empty, reload, twist and you’re ready to go – perfect for clearing corridors upon corridors of rooms in CQB, because of this they are my personal choice for a reusable impact grenade. I will however say that you are limited as to where you can use them, because of the materials they are made of and the weight of them, you should always check with the site staff if there are any restrictions as to where they can/can’t be deployed and what size blanks you are allowed to use on site as this will vary from site to site. I hear from a little bird at JD that Concept Tactical have a few more projects in the works at the moment which will be announced at the end of this year so watch this space, we will be seeing a lot from them in the near future! Earlier this year JD Airsoft launched the much anticipated JDBay! Which is Airsoft’s answer to eBay. It is a standalone website that like eBay has product listings which users can bid on, if you already have a JD Airsoft website account, you can log straight on and start bidding or create an account. The products on the website vary from brand new stock, ex-display products to refurbished products. It’s the perfect place to pick up a bargain. It is set out in an online auction style so it is incredibly easy to use and all the products listed are dispatched from their store in Cannock. Everything you need to know about your potential new gear is stated in the description box – so make sure you give it a thorough read before bidding! 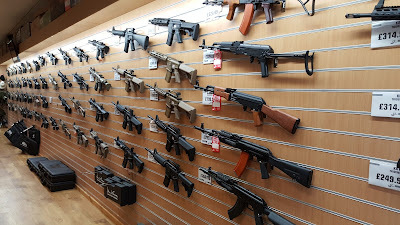 I have been to a fair few Airsoft shops in the time I’ve been Airsofting, some very good and some not so good and JD Airsoft is definitely the top of the bunch for me personally. Their central location makes the store an easy to reach location for a large proportion of the UK’s Airsofters, and any potential customers that are out of reach, can get most of the items they stock in store through their website, or alternatively you can always give them a call as they are always willing to go above and beyond for their customers. The range of products that they stock is fantastic and they only stock brands that you can trust so you know you can be confident in your purchase. Their after sales care and support is second to none so never be afraid to pop in with any queries or dilemmas you have – you will always be greeted by a smiling face behind the counter. The staff are my favourite element to the store, as they are a great bunch of people who always make you feel welcome. They are always happy to help and are knowledgeable, offering sound advice to their customers on a range of subjects. It is clear from watching them interact with their customers in store that they are passionate about Airsoft. All these elements make the store a great place to shop, I would recommend this store to both new and seasoned Airsofters. Free parking located outside the store. K. Hardwick. (2015). JD Airsoft: Revisited. Airsoft Action. September (52), 72-74.